1. When called to Dean Cobbs’s office the day after cooking in the Bond kitchen and serving an Italian dinner for friends, the women in question were asked: “Does spaghetti really taste better with wine?” This, because alcohol was forbidden on campus. As I heard it, the story was always repeated with a soft southern drawl, apparently Dean Cobbs’s natural voice. I’d like to confirm these stories with members of proximate classes, since I am only repeating what was told to me. The editors of the Bulletin would also like to know how alumni remember these—and perhaps other—of Dean Cobbs's witticisms. 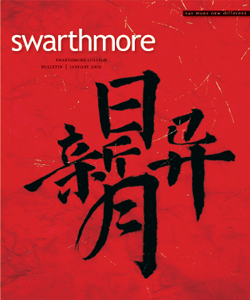 Write to us at bulletin@swarthmore.edu, or post a comment at our new interactive Web site: bulletin.swarthmore.edu. Mail with a stamp on it is welcome too. I knew and greatly admired Susan Cobbs before she went to Swarthmore as Dean. I can confirm the "you can do it twice" story, not that she told me, but that a Swarthmore alumnus who actually heard her say it, I think, told me about it not knowing that I knew her. I think his version was "You might do it twice." His name was John Pessolano (spelling uncertain), and I met him at a friend's place in NYC in the 1970's. Susan's beautiful South Alabama speech was a joy to hear. It was quiet and really on the quick side; I wouldn't call it a drawl. She carried her learning lightly, liked detective novels and doublecrostics, and told a story well. I had the good luck to be assigned to the faculty-staff house at Agnes Scott College to which she came when she joined the faculty in 1941. I was nearly 21, she nearly 36 and of course well out of my league. She immediately became a success with both faculty and students. I left in 1943 for graduate work at Penn, but kept in touch. In the spring of 1945 I called to ask her summer plans and she told me she was going to Swarthmore "to be a dean." I was very sad for my college. I went back to Penn in 1954 for doctoral work and saw her once or twice a year in the Benjamin West house where she lived, and later at an off-campus address. One Sunday afternoon in 1975 I was here at home marking a set of college papers when I had one of my semiannual fits of wanting to call her up. I rang her house in Greensboro but got no answer. I later found that she had died that very afternoon, in a Birmingham hospital. I see that somebody connected with the book "This I Believe" would like information on her, but I don't know what to contribute.